It’s a feeling like no other. The freedom of the outdoors. The cold air in your nostrils, filling your lungs. This is what it’s like to explore the Great Wide Open. For many of us, the Great Outdoors is just open land to hike across, to explore safely. It’s a wonderful walk, yes, but there are others who go that extra mile. Those brave souls who take on the most majestic of Nature’s structures: mountains! The satisfaction in mountain climbing is the true sense of adventure. It’s an expedition, a journey that leads to excitement and the burn of adrenalin. Even from the initial preparation of a climbing trip, the exhilaration is remarkable. But what climbing equipment do you need? Let’s take a look at some of the essentials that should be among your kit. While there are a great many accessories that will improve your climbing experience and safety, there are three main areas that among the most important. These are your climbing helmet, your harness and your shoes. When preparing to climb, the right helmet is essential. To help you make your decision, the best place to start is thinking about the kind of climb you’re embarking on. Is this a short climb, or are you going for the long haul? The weight of your climbing helmet can add to discomfort over longer climbs. There’s a great choice for different climbing circumstances, including really tough inners, or lightweight expanded polystyrene liners. The fit is also incredibly important. Ensure that your climbing helmet is very securely fitted, with no room to jiggle or slip. The helmet must be positioned correctly for the duration of your climb; if it slips forward, for example, your vision will be affected and the back of your neck will be unprotected from falling rocks. You will also need to make sure that you can look up without the back of your climbing helmet interfering with your backpack, pushing the helmet out of place. The climbing harness is made up of different components that work together to ensure a safe climbing experience. An understanding of these components will help in making a decision when finding the right harness. Belay loop – made from nylon webbing, the belay loop is the harness’ strongest point. You can attach items such as locking karabiners to the belay loop, but it is not designed to have anything tied to it, as it can wear out quickly. Leg loops – leg loops need to be comfortable and adjustable. Not only do leg loops help to keep you supported, over long periods of climbing they should be easy to adjust for clothing changes. Haul loop – the haul loop is a piece of stitched webbing to a attach a haul line or secondary rope. It is not designed for load bearing. Gear loops – made from a variety of materials such as plastic or webbing, gear loops are made to carry climbing equipment and accessories. Like the haul loop, these must never be used as an anchor or as safety equipment due to the fact they are only designed for light duties. Tie-in points – connected to the belay loop are are upper and lower loops called the tie-in points. All ropes, webbing and cord should be attached through these tie-in points, adding redundancy and distributing the wear. The tie-in points are not for use with karabiners when rappelling as this will weaken the karabiner. Rise straps – connected with elastic or webbing straps, the ‘rise’ is the distance between the waistbelt and leg loops. 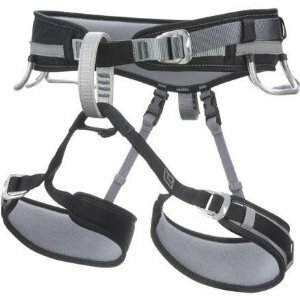 These are adjustable, and offer the ability to adjust the harness’ shape for comfort. Finding Your Feet – and the Right Climbing Shoes! The choice of climbing shoes is, along with the previously mentioned equipment, an important one. Your shoes need to be comfortable and enable you to traverse a rock face accurately. There was an old rule that you should wear climbing shoes that are a size smaller, as these will ensure that they will be snug for the best results. Over time, the shoes would eventually expand to fit you better. In recent years, great advancements have been made in the field of sports footwear, and climbing shoes have benefited from this. Your comfort is a priority, therefore you need to find a pair of shoes that will fit you correctly from the get go. There’s no point in feeling any pain from the very beginning of your climb in the hope that you will eventually break your shoes in! I hope these pointers have been of some help if you’re starting out as a rock or mountain climber, or just need a refresher. This is, however, just a guide. It is important when undertaking any climbing always seek professional advice from your climbing kit supplier. Trekitt supplies outerwear and climbing equipment for for men, women and children. This entry was posted in Land Sports, Rock Climbing and tagged Rock Climbing, Rock Climbing Equipment. Bookmark the permalink.